Albert van der Sel : Fubctions with more than one variables. In the series: Note 11. This note: Note 11: Functions with more than one variables, like f(x,y) or f(x,y,z). Please be sure that you are on a "level" at least equivalent to the contents up to, and including, note 10. This is a simple and short note on functions with more than one variable, like z=f(x,y). curve (for example, a parabola), in the 2 dimensional XY plane. accustomed to use the letters "x" and "y". There is absolutely no fundamental difference, if we would replace "x"
more appropriate, symbol. It makes no difference at all. Now, having a function depending on more than one variable, is a difference indeed. For example, we may have a function z=f(x,y) where z is dependent on two variables (x and y). Or, we may have a function w=f(x,y,z) where w is dependent on three variables (x and y and z). And we can even have any number of variables, like "n" variables as in the function r=f(x1, x2, ..., xN). 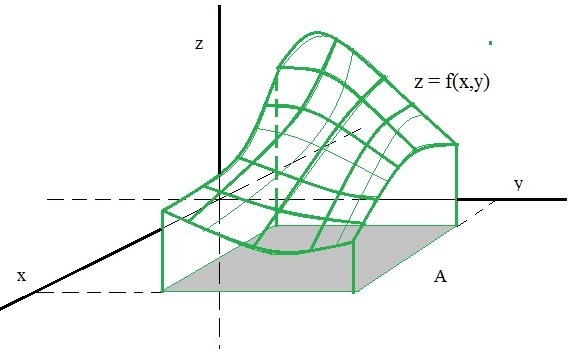 a function in the form z=f(x,y), often correspond a "surface" in three dimensional space. That's why those functions "z=f(x,y)" are relatively easy to "graph" in an XYZ coordinate system. an x- and y- and z-axis. 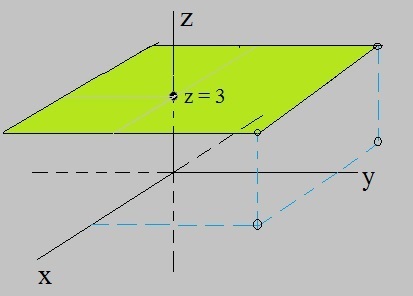 the class R2 -> R, since points (x,y), which are in the XY plane, are "mapped" to "z" on the z-axis. This way, a "surface" in 3D space appears. are mapped to a certain z-value. The connection of all those z-values form a "smooth" continuous surface. (However, "smoothness" is not garantueed ofcourse with all sorts of possible z=f(x,y) functions/relations). Figure 1. Just some z=f(x,y) example function. In this case, we see a two dimensional "surface" in three dimensional space. Let's inspect a well-known z=f(x,y) function. Figure 2. An example of a two dimensional "surface" (a parabola) in three dimensional space. It's easy to proof that this example is a two dimensional surface (a curved surface in 3D space), in the form of a parabola. the YZ plane. That is no more than the familiar parabola we have seen in note 3. In fact, we have z= y2. the XZ plane. Again, that is no more than the familiar parabola we have seen in note 3. In fact, we have z= x2. coordinate system with an x-, y-, z-, w-axis, and we simply have difficulties in creating a mental picture for that. or "N" axis (N dimensional space), is not a problem at all. In the next sections, we will spend a few words on f(x,y) and f(x,y,z) functions (or relations). this to be a real "issue". So, if you like, like most do, call it a three dimensional parabola. 2. Some example of "z=f(x,y)" functions (or relations). where the x-, y- and z-axis intersect. For a Sphere it holds, that for every point on that surface, the distance to the origin is exactly the same. from the good old "Pythagorean theorem", which you might know from the right-angled triangle (a2 + b2=c2). the x-, y- and z-axis with a "distance" of a, b, and c respectively. Figure 3. 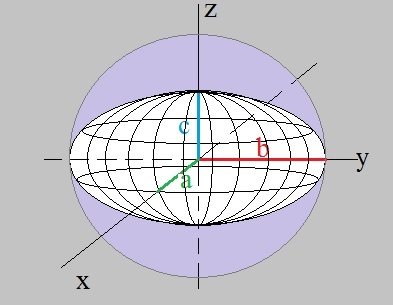 An example of an "ellipsoid". If a=b=c, then it's a Sphere. - the length "c" closer and closer to "r". Here ofcourse, "r" is the radius of a Sphere, where a, b, and c, all three, get closer to. a, b, and c "goes to" r.
So, the other way around is likely, since the reasoning above, is plausible. Alright, it's not exactly "proof", but merely a way to make matters "likely to be correct". Let's again take a closer look at 3 Dimensional Parabolas. Often, they are called "Paraboloids". The values of a , b and c, define the "shape" and location of the Paraboloid. Let's take a look at "c" first. Suppose we now have f(x,y)=x2 + y2 - 3, so we have "c"=-3. Then the "nose" of the parabola, is at (0,0,-3) (or x=0, y=0, z=-3). You may say that the whole parabola has "sunk" along the z-axis by 3 units. Suppose we now have f(x,y)=x2 + y2 + 5, so we have "c"=5. Then the "nose" of the parabola, is at (0,0,5) (or x=0, y=0, z=5). You may say that the whole parabola has "risen" along the z-axis by 5 units. Now, let's take a look at "a" and "b". "a" and "b" very strongly define the shape of the parabola. a 3D variant of the familiar 2D parabola. - We have a socalled "Hyperbolic" Paraboloid when "a" and "b" have different signs. This one resembles a "sadle". In the latter case (the "saddle" shape), the surface resembles even more a 3D hyperbola. Due to the large variations in shapes, equation 3 is not really "general", in the sense that it really covers all cases. What is the general equation of a "straight" plane in R3? In figure 4, you see one of the most simplest examples. It's a plane parallel to the XY plane. In this particular example, the plane intersects the z-axis at (0,0,3). It never crosses the XY plane, since it is parallel to that plane. In this example, it is really sufficient to say that the relation is "z=3". Or, in other words, for all x and y, it is true that z equates to "3". Figure 4. An example of a plane in three dimensional space. I tell you, that when we will work with "vector calculus" (note 16), a new and much simpler "world" will open up. For now, we are dealing with regular Calculus. And you can easily rewrite equation 4 in the form "z=f(x,y)=", since that is no more than some arithmetic. So, if you like, "z=fx + gy +h", where I have used different coefficients (which is allowed ofcourse). But since many textbooks and articles use equation 4, I did the same. Note that the relation is a linear equation, just like "y=ax+b", which we know from note 2. So, for the equation "z=3", as illustrated in figure 4, we may write "z=0x + 0y + 3". It seems that if the coefficients used for "x" and "y", when they both are "0", we have a parallel plane. Now, just as with "y=ax+b", it is true that "a" determines the "slope" or "gradient" of that line. It's really no different with a plane expressed by "z=fx + gy +h". Suppose the coefficients "f" and "g" both are > 0, and "f" > "g", then you see what happens? The plane gets a slope as well, and since "fx" goes faster up than "gy", z increases more when measured along "x". So, in this case, we have a tilted plane going upwards when x and y both are >0, but more strongly so along x. Why do we know that this plane goes through the Origin? Well, if x=0 and y=0, then z=0 too. You might think that this should be the most easy one of all. It is..., in vector calculus. In ordinary analysis, the equation is not so very straight forward and intuitive. and (a,b,c) is some specific vector, defining a specific direction (namely, that of the line) in R3. Again, we will see all about it. Also parametric forms will bee shown in note 12. Don't worry. This is for note 16. 3. The derivatives of z=f(x,y). In note 5, we explored the theory of finding the "derivative" of a function in the form y=f(x). We essentially wanted to find the rate of change of f(x), compared to the the rate of change of "x". Indeed, here we had only one variable, so we only could inspect the variation in f(x), when x varies. of the tangent line to f(x). If that all is a bit fuzzy, maybe you want to review note 5 again. Here, with functions z=f(x,y), we have a similar situation. (2). We may try to find the rate of change of f(x,y), compared to the the rate of change of "y". on the graph of f(x,y). It's not a bad interpretation, in many cases, but there is a catch. that y is constant. This might be some sort of problem. then still "y" changes too ! If you deal with ∂ f(x,y) / ∂ x, then you consider "y" to be constant, like y=b. If you deal with ∂ f(x,y) / ∂ y, then you consider "x" to be constant, like x=a. In such a way, the interpretations are the gradients of tangent lines in the x- or y- directions. To calculate the partial derivatives is then easy. It's just like calculating an the derivative of one-variable function. then y still will always vary?" Yes and No. In your example above, we take a fixed y, like y=b, and simply only focus on the variation in "x". we are indeed able to focus on the rate of change of "f" compared to the rate of change in "x" only. takes into account all variations, so for "x+h" and "y+h" simultaniously. Suppose f(x,y) = x2y3. Determine the partial derivative of f(x,y) for x, where y=b. ∂ f(x,b) / ∂ x = ∂ x2b3 / ∂ x = 2xb3=2b3 x.
so for "x+h" and "y+h" simultaniously) to a later note. Anyway, the partial differentials of a function, and "partial differential equations", play a key role in math and physics. with respect to position and time, which gives them insight in the behaviour of a physical system. 4. Intersections of f(x,y) with the coordinate axes of x, y, and z. In note 6, we analyzed functions of the form y=f(x). and finding the minima and maxima of the function (if present). Since the function z=f(x,y) is most often some surface in R3, we can do a similar analysis here. Really a similar approach can be used as we already saw in note 6.
the partial differentials must be "0". From those relations, the corresponding "x's" and "y's" can be calculated. Intersection with the z-axis: then x and y are "0". Intersection with the x-axis: then y and z are "0". Intersection with the y-axis: then x and z are "0". This generally gives us a means to calculate the corresponding points. 5. A few words on a function or relation with 3 variables: f(x,y,z). 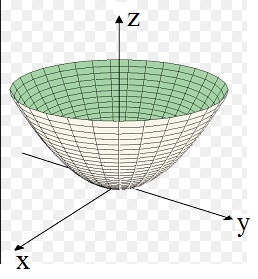 The function z=f(x,y), most often corresponds to a "surface" in three dimensional space. We often view it, as that points (x,y) are mapped to z, which leads to a surface (like the parabola in fig 1). What about functions like w=f(x,y,z)? Here w is dependent on 3 variables. We cannot graph that anymore, since we now need 4 spatial dimensions, namely x, y, z, and w.
We have to be carefull before we think we can associate surfaces or volumes to such functions. Still, those functions, or relations, are often used in physics. attribute a certain magnitude of that potential (potential energy, pressure, or other sort of potential). It might vary slowly or rather fast between small distances of two arbitrary points (x1,y1,z1) and (x2,y2,z2). Such function are often called 'scalar' functions, since w=f(x,y,z) is simply a number. By the way, in the case of z=f(x,y), z is simply a number too, so here too we may call them scalar functions. Calculating the partial derivatives is done in the same way as was demonstrated in section 3. Take note of the fact that on the right side of the "=" symbol, that we see an expression of "x", "y", and "z". Again, it's a scalar function, meaning that the function values are real numbers again. Since I want this to be a very short note (it's just a mere introduction), I will move on to note 12. Remark 18 sept 2016: the theory presented here, will be covered in a little more "depth", in note 17. The next note is a quick intro in Vector calculus / Linear Algebra (Part 1).